Jaworski, William (2011). The Philosophy of Mind: A Comprehensive Introduction. Wiley-Blackwell. Kindle version available. ISBN: 978-1444333688. There are several books with a variant of this title. What attracted to me to this one was the promise in its publisher's description that it is "written in a clear, easy to read style that is free of technical jargon, and highly accessible to a broad readership". Well, it isn't. 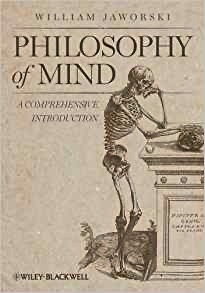 It isn't a bad book, but it doesn't stand out from all the other philosophy texts on the philosophy of mind. I was looking for a book I could recommend to a psychology or computer science undergraduate that they could read and get a good understanding of the basic issues. This book is aimed, or appears to be aimed, at philosophy undergraduates who already know something. I'm still searching for the perfect introduction. As well as the argument being difficult to follow, or perhaps expressed too quickly, it isn't at all free of technical jargon. My second gripe is that the jargon isn't always standard. The author prefers some non-standard phrases, which he might technically be correct, will confuse students. Forgoing property dualism is one example. My third complaint is that he makes no effort to be neutral, preferring a theory of mind called hylomorphism. I hadn't heard of it either, and some space is devoted to it that might have been spent for an introduction. Finally, as with all these books, it looks dull and unfriendly. Why can't publishers be a little bit imaginative with presenting philosophy texts? It's not a bad book, and certainly no worse than its competitors, but given the promises I was disappointed. It's also available for Kindle, unlike many of these books. My main complaint is that in spite of the title it is no introduction. My plan is to read it again in a year or so and see if I get anything more from it. Here are my reviews of some books on consciousness. I'm trying to read from the point of view of the average student, not academic. Bayne, T., Cleeremans, A., & Wilken, P. (2011). The Oxford Companion to Consciousness. Oxford: Oxford University Presl. Kindle version available. ISBN: 978-0198569510. There are several "handbooks" and "companions" to consciousness, and they're very useful things to have to, hopefully summarising the field. How do they line up? The first thing to note about Bayne et al. is that there is confusion about the publication date. Inside my hard copy it says 2009; the website says the online version is 2010; Amazon gives the date as a reprint version in 2014. However I'm hard pressed to find any citations to work after 2006, so I assume most of the entries were finished in 2005 and 2006. This point is more than pedantry: it's important because consciousness research is a fast moving field. Therefore I consider this book to now be pretty dated. It's massive, nearly 700 hard pages long, and made up of entries in alphabetical order on just about anything and everything related to consciousness, each written by an expert in the field. Multiple authorship means a huge variation in the readability and ease of understanding. Reflecting my expertise, I found the psychology entries straightforward, the neuroscience ones OK but a few more diagrams would have helped, and the philosophy ones more hard going, although there were exceptions. The entries written by Susan Blackmore and Daniel Dennett were exemplary, and the work would have been stronger if it had been edited so that all the entries were of the same standard. The editors have my sympathy though because putting it together must have been, as the saying goes, like herding cats as it was. It's not a book for someone new to consciousness, such as undergraduate student taking an option in the subject. I read it like a novel, from start to finish, and it took me ages. I did know much more at the end than at the beginning, however. It is most useful as a work of reference, for people who want to learn more about individual topics. It is worth browsing though because there are some pleasant surprises in the entries. I'd completely forgotten about the refridgerator light problem, for example. Overall the entries individually and collectively are pretty balanced. Each entry has an excellent if now dated set of references for yet more detail and further reading. There is a e-book available, but it doesn't have the colour plates of the hard version, which is a shame. 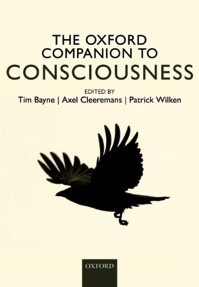 Overall then a useful addition to the overview literature on consciousness. The main problem is that it is now too dated.